What is the Preschool Magic Show? Lee Curtis comes to your school dressed as a wizard, a friendly looking wizard. 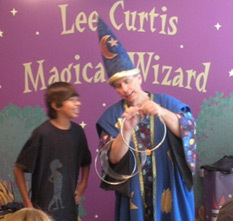 During the magic show there is a lot of audience participation, where the children come forward to help Lee Curtis do the magic. Sometimes the magic happens right there in their own hands. The show is very interactive, Lee Curtis will ask the audience questions, plus lots of laughter, that keeps the children involved and entertained. Lee Curtis’s character can be best described as being an “absent minded & bumbling wizard”, where things go wrong in a magical funny way, and then it is the kids who make everything work out okay by yelling out the “magic words”. This way they are all participating throughout the entire show, even when sitting down. It is a very interactive show. For the preschoolers the magic words are always educational re-enforcement , for example they may well be “Please and Thank You”. What is the Day Care Magic Show? Lee Curtis comes to your dat care dressed as a wizard, a friendly looking wizard. 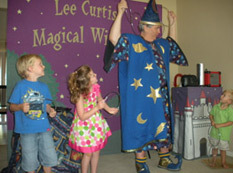 During the magic show there is a lot of audience participation, where the children come forward to help Lee Curtis do the magic. Sometimes the magic happens right there in their own hands. The show is very interactive, Lee Curtis will ask the audience questions, plus lots of laughter, that keeps the children involved and entertained. How about something different? A Magic Workshop. 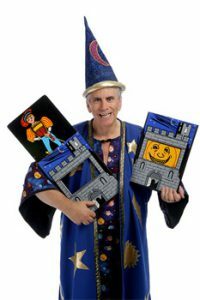 Lee Curtis is the Magical Wizard, in this exciting new workshop for school-age day care. He will come to your day care and teach magic tricks to the kids, that they can do! 60 Minute Workshop of astonishing magic that the kids, themselves can do! A special "Self Esteem" message presented in a magical unforgettable way! Magic Kits full of necessary props and instructions, for each child, so they can continue to practice their magic tricks.